This was given to me a few months back when I first expressed interest in playing the violin again. I think she's seen better days, but what do you all think, is this worth repairing at this point? I kinda like it, has a lot of character . Hard to tell from one picture but you probably just need new strings and probably a new bow. Judging by the looks of the chin rest, it appears to be an old violin. I have a 130 yo violin with that same type chin rest, very small and basic. I would think that for around $ 125.00, it can be put back in playing condition. From what I can see, it need's a tailpiece adjuster, or tail gut, new string's, sensibly priced, and bow rehair job. Is the sound post still standing inside, even if it is, it would be wise to have a new sound post installed, they do wear out. You may want to show more picture's from different angle's / view's for us to see. Are the seam's tight where the top and bottom attache's to the rib's?. Violin's have a tendency of seam seperation at the chin rest end because of body heat and moisture, I think. 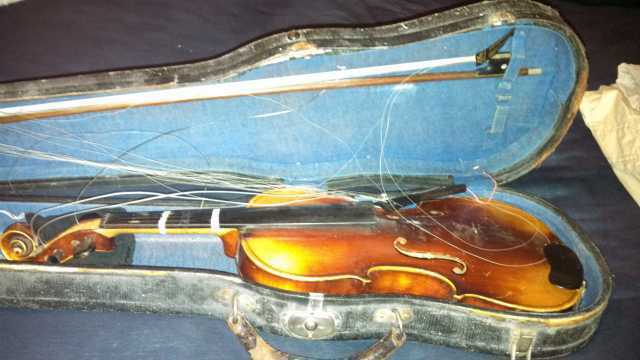 My violin had seam seperation at 5 month's old and was brand new last August. I think with a little bit of work, you have a keeper there. I have an aged viddle >Not sure what to do with it?? > I thought I might fix it up. Yeah,~~~ I think about fixing a lot of things up. If one has not much time to do such a thing > But wants to check it out > would you go local or via the net??? > to have a vilddle checked out??? You already have at least one in good playable condition,, begin by comparing the two. Begin by inspecting the top and back, check for crack's in the wood. Check where the top and bottom meet the rib's, any seperation need's to be repaired. They generally seperate at the chin rest end, more than not, if they are going to come apart at all. Check your tailpiece adjuster and by all mean's have a new sound post put in by a qualified luthier, the sound post must fit exact for the best sound. Maybe a new bridge will also be in order. I don't see a bridge in Joseph's picture; hopefully it's in the case somewhere, otherwise add that to the cost of getting the violin playable. And make sure it's a 4/4 size; hard to tell from the picture but looks like it might be smaller. But as Ken mentioned, $125 might be a reasonable amount to get a working outfit. Honestly, I'd love to get my hands on it. I definately think you have a violin worth fixing up. Photo #1. Looks as if the string's are real gut and "Piastro" brand. Two bridge's, which appear to be of different width's, no big deal a new bridge can be fit also. Those pesky bow bug's have attack the bow hair and it will need to be rahaired. Like I said in my previous post, you will need a new tail piece adjuster. Photo #2. I see below the end pin there is some seam seperation. Several nick's and scratche's which are minor. I see no crack's in the top, what about the bottom. Photo #3. Antonio Stradivarious label, more than likely/probably it's a copy, although one never know's. Stradivarious made over 1,100 stringed instrument's in his lifetime, no one really know's how many are still around that have not been discovered. Maybe some were lost in house fire's or just thrown away do to damage that was thought unrepairable. From the light shining in from the opposite F hole, you can see what appears to be the shadow of the sound post, (still standing) but you will need to have a new post fit properly by a qualified luthier. I also see the two nitche's in the F hole are not staggered, they appear to be directly opposite from each other, unless it's just the angle the photo was taken. I have no idea if that has any bearing on the age of the instrument or the violin maker. Photo #4. It absolutely need's a new set of peg's. 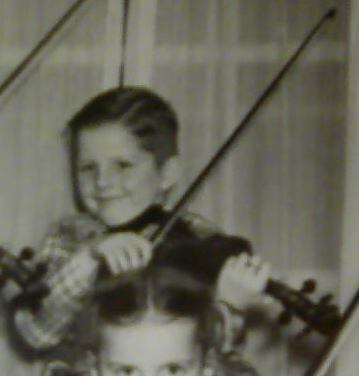 I would say that that violin has been played a whole lot, judging by the G string peg, it's been tuned and pushed in so many time's that the peg protrude's way past the outside of the peg box on the E string side and has greatly enlarged the hole, the thumb nut is broken off for the A string peg which is visible in photo #1, laying next to the two bridge's. In my opinion it's definately worth repairing and made playable again. It has a nice grain in the top wood. From what I can see you need a tailpiece adjuster, and a set of strings. Setting the violin up from scratch is tough for a beginner but you might be able to pull it off. Where do you live? There might be a FM member that lives close by who would be willing to help. Depending on the condition of the pegs and bridge (a few other things as well but probably no problem) you should just probably just be able to invest under $30, less if you go with cheap steel strings and be playing in no time. Very important that you don't string it up if the sound-post has fallen or is missing. The sound-post can be seen from the other f-hole opposite of the label. Look inwards towards the center at an angle to see it. If there is a small wooden dowel loose inside the instrument, that is it. Very cool, thanks for all of the advice guys. There is indeed a sound post inside and it seems to be intact. There are two bridges of different sizes and one of them appears to be angled in an odd way....or maybe it's normal, not quite sure....either way I'll post a pic. Note how the bridge seems to curve down on the left side? I've no idea if this is normal or what. I think I may just try and fix this one up myself (or contact a local member, thanks for the idea on that btw). It'll be a great learning experience. Any ideas on how to determine the approximate age of the violin? The only thing in my opinion that matters is what is it worth to you? The glued together parts are the only things that dont get improved upon anyways. mostly. I think its beautiful and if you dont want to restore it, send it to me. I have a violin, probably of a similar age, that was in similar condition a little over a year ago, and I was able to set it up on my own. As Pierre said, you can get this thing in shape for not much money. It needs a new tailgut, strings, one peg, and possibly a sound post. You already have a different violin you can play, so you don't have to be in a hurry. You can study up and do the work yourself---and the question you asked about the asymmetry of the bridges indicates that you have a lot to learn. I'll mention a few points. Each peg is fitted to its particular hole, so don't go taking them all out at once without a way to be sure each one goes back in the right hole. See the recent thread wherein @ozmous fits new pegs to his violin using sandpaper. Don't go trying to clean it without reading up. Yeah, make sure the soundpost is up and fitted in the right place before you string it, or you could crack the top. I would not put the cheapest possible strings on it. Preludes at about $15 make a good start. Sometimes the spruce top ages and shrinks faster than the ebony saddle, and that can cause the top seam to open when you restring it for the first time in years. Removing and replacing the saddle and shortening it by say half a millimeter would prevent that. The one to the left looks like the best one. The lower side is meant for the E string side. I'm pretty sure you can just string it up and begin to play after getting your tail-piece adjuster and strings. I'm really enjoying this thread. SO much advise on restorations! Love it. Thanks to all who have contributed. I've learned some things here and I dig it!